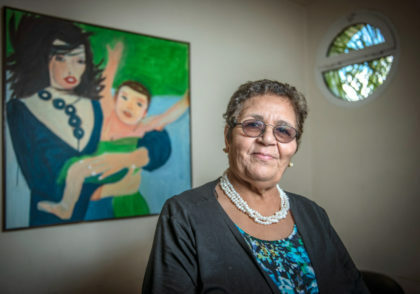 Aicha Chenna, a Moroccan civil society activist defending for more than five decades the rights of unwed mothers and their babies to a decent life, has received the Monte Carlo Woman of the Year Award in Monaco in recognition for her lofty actions in promoting civil rights for a vulnerable social category. Aicha Chenna was distinguished by the prize committee, which chose to celebrate women who champion the cause of human rights and gender equality as a theme for the sixth edition of the prize. As a national figure, she contributed actively in the public debate on the rights of unwed mothers. She has also been advocating legal reforms to guarantee the rights of this marginalized social category. Aicha Chenna started her career in the 1960s as a nurse when she witnessed the miserable conditions of disadvantaged unwed mothers and their babies. She was particularly appalled by the fate of abandoned babies born to unmarried women who are then sent to miserable conditions in orphanages. Having witnessed such social injustice, Chenna decided in 1985 to move to action by founding the Association Solidarité Féminine (ASF), a Casablanca-based charity that assists single mothers and victims of abuse. The association offers single women training in literacy, human rights, cooking, baking, sewing, fitness services and accounting. Participants also receive daily childcare and medical treatments in addition to social, psychological and legal support and counseling for a better reintegration in their society. Her stupendous social work in favour of unwed mothers caused her the backlash of conservative circles who accused her of encouraging prostitution. To her detractors, Chenna, who often talks about herself as a devout Muslim, makes it clear that her work is inspired by a sense of justice rooted in all religions. In 1996, Chenna published her first book, Miseria, which tells poignant stories and testimonies of the suffering of young girls and their experience with social stigmatization and rejection. Chenna’s staunch defense of civil rights earned her numerous international awards and recognitions, such as the 2009 Opus Prize. In 2013, she was named Knight of the Legion of Honor by France for the five-decade long commitment in favour of the cause of Morocco’s single mothers. Just last year, she won the World Bank’s Global Partnership for Social Accountability (GPSA) Award for the MENA region. With a strong faith and resolute commitment, Chenna endeavors to changing societal perceptions of single unwed mothers who are often ostracized and treated as a socially taboo group deprived of civil rights and prospects to lead a decent life.